FleetWatch hosts the first Brake & Tyre Watch for Operators in partnership with HINO. 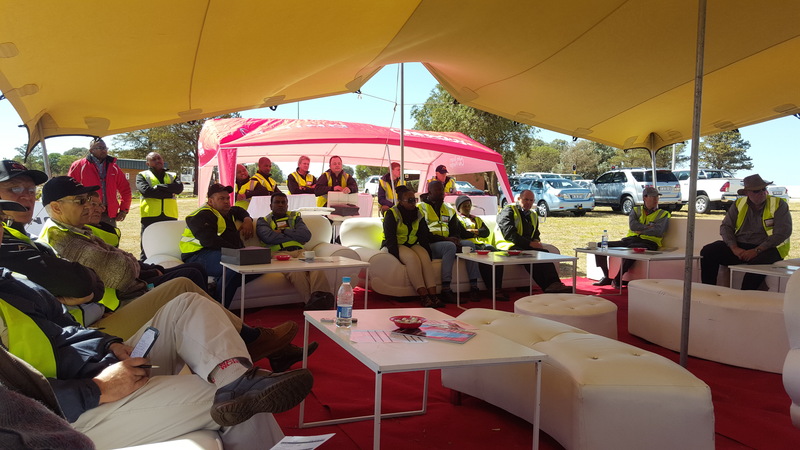 FleetWatch has, for the first time, hosted its ‘Brake & Tyre Watch’ event directed at operators and related personnel instead of Traffic Officials. This is a contribution to Transport Month and involved staging a few ‘industry’ days, the first having been with HINO on the 3rd October. Normally it is traffic officials that are trained by the Brake & Tyre team to learn how to detect the numerous faults found on trucks with the aim of empowering them to be able to discontinue defective vehicles with confidence. Over the ten years that Brake & Tyre Watch has taken place 679 trucks have been tested and an average 68% are consistently failed. What follows is the story of the October day as seen and written by Roger Houghton looking through the eyes of HINO. FleetWatch applauds the initiative taken by the company to educate its staff, dealers and operators – an important exercise to improving road safety. We also extend a huge thanks to our partners who so willingly gave of their time and expertise on the day. Without them, none of this would be possible. 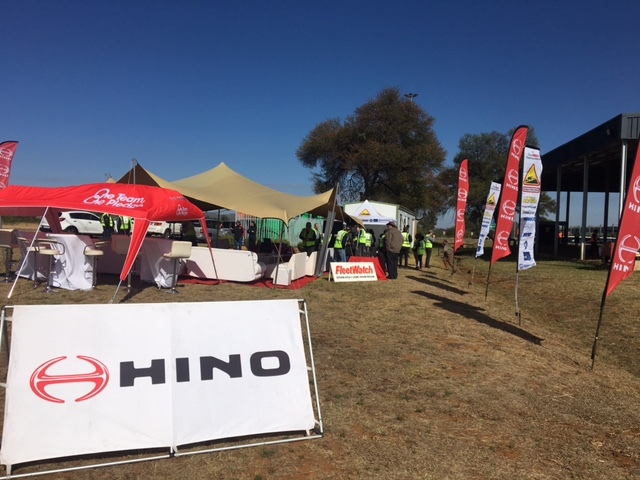 Hino South Africa, one of the country’s leading truck manufacturers, recently sponsored the first joint Brake & Tyre Watch event to be attended by truck operators, Hino dealers and a large number of Hino SA staff. 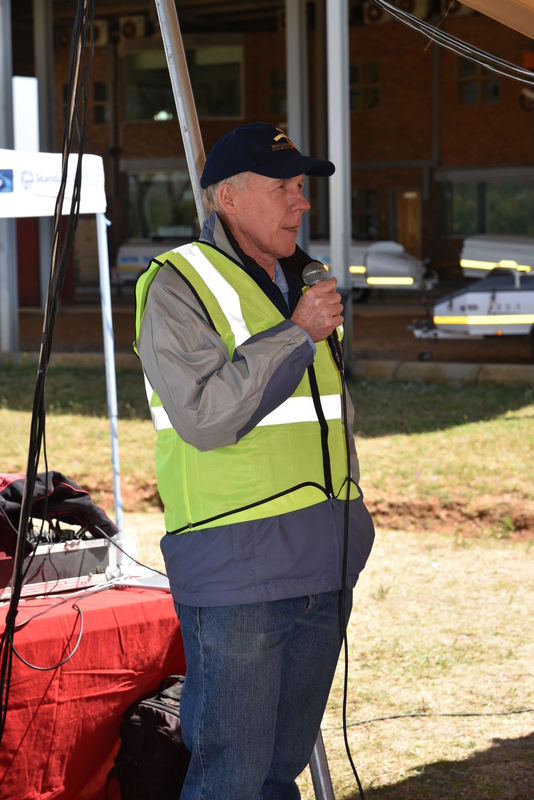 It certainly proved an eye-opener for all who those who were at the Donkerhoek traffic control centre, east of Pretoria, for that informative road safety check. This was the 34th occasion that road safety champion Patrick O’Leary and his FleetWatch team had staged a Brake & Tyre Watch roadside safety check, but it was the first time the event had been concentrated on one truck brand and its people. Representatives of long-time supporters of this excellent, hands-on roadworthy check on trucks, which started more than 10 years ago, were on hand with excellent presentations that varied from trailers to braking systems, tyres, axles, the SA Road Federation (SARF) and the Road Transport Management System (RTMS). What impressed was the fact that all the presenters were passionate and very knowledgeable about their subjects. It was most inspiring. O’Leary kicked off proceedings with a scene-setter about the road transport situation in South Africa which was both enlightening and chilling. Imagine hearing that a major transport company which screened potential drivers could find only seven out of 100 that they believed could be trained to meet their high standards! No wonder an average of 43 people die on the roads of South Africa every day of the year. The accident rate in SA is 20 times worse than that of Australia, a country with far more vehicles on its roads. There are 18.4-million registered vehicles on Australian roads compared to 10.2-million in SA. 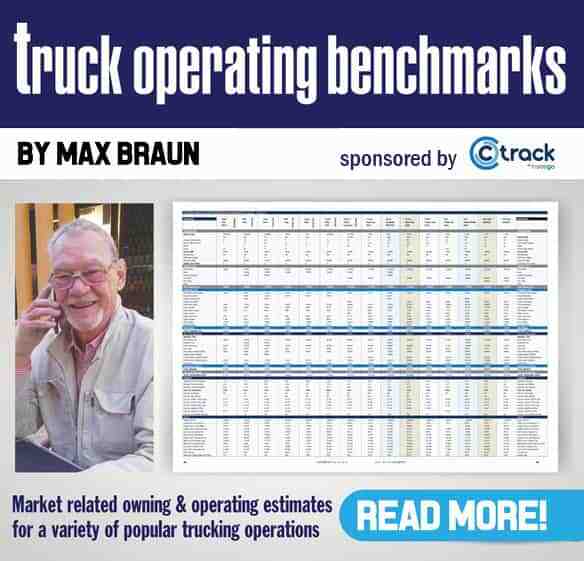 Trucks account for 600 000 units in Australia and 360 000 units in SA. 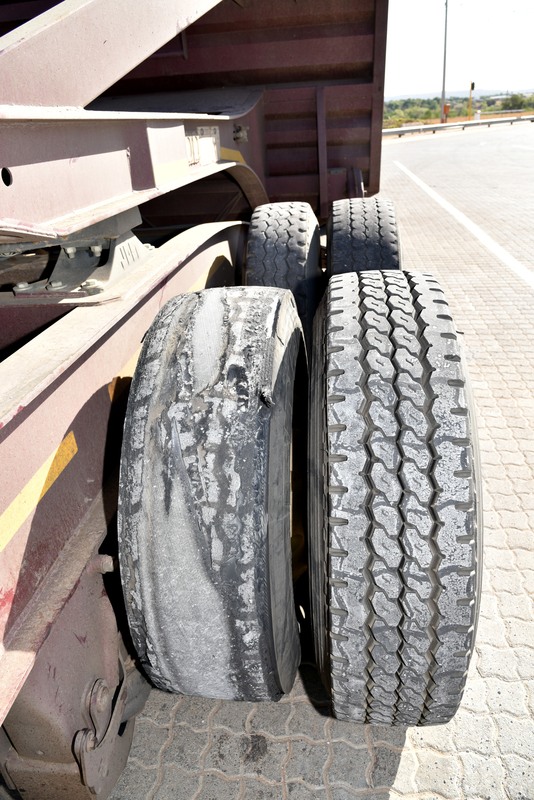 The high accident and death rate in SA is to be expected when one hears that the statistics obtained in FleetWatch’s Brake & Tyre Watch examinations over the past 10 years have revealed a failure rate of 68%, with 485 trucks being declared unroadworthy out of 679 trucks tested. 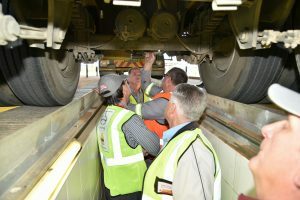 Trailer expert Wolfgang Lehmann gave some shocking statistics about the dangers of using cheaper, non-genuine brake and suspension replacement parts on trailers, as well as danger signs one can see on worn or cracked fifth wheels and their kingpins. The group of trainers from Brake & Tyre Watch…always passionate whilst imparting valuable knowledge. Lehmann said that some non-genuine trailer brake drums on sale in SA were made with not only significantly less material, but also made of the incorrect metal. He also warned about the importance of using the correct number and type of lashing straps when securing loads. 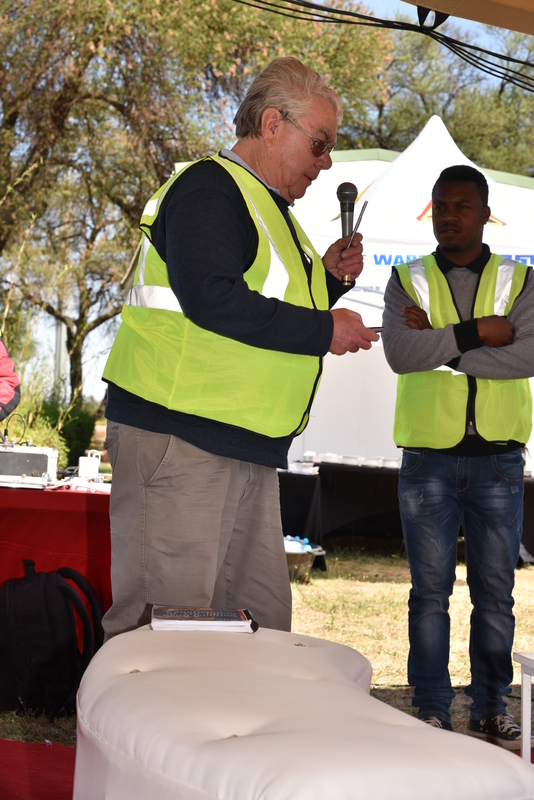 Wabco’s Johan van der Merwe explained the intricacies of the latest braking systems on trailers and again stressed the importance of proper checks and maintenance to ensure the correct operation of the systems. He also warned about the use of non-genuine replacement parts, particularly brake boosters, where cheaper versions often have shorter push rods which can affect brake balance. 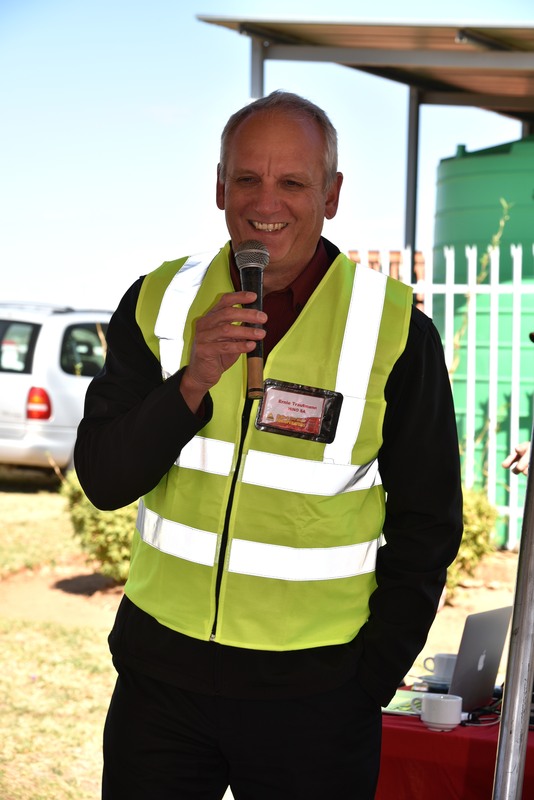 Paul Nordengen, of the CSIR and SA Road Federation, was a fountain of knowledge on roads and the manner in which overloaded trucks damage them. 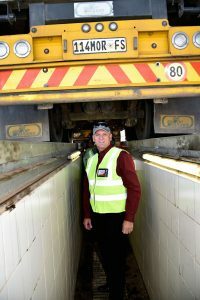 He said that a recent survey in Mozambique had shown that 80-90% of the trucks there were operating in an overload condition, with the maximum overload reported being a massive 53 tons! Nordengen added that operating a truck on bad roads could more than double maintenance and repair costs. Tyre woes – completely finished, no tread on entire circumference – a killer on the road! The roads and transport expert warned that matters were going to get far worse as the amount of freight moved globally, using all modes of transport, was expected to increase 4.3 times between 2010 and 2050! Nordengen is a strong protagonist for the use of the Road Transport Management System (RTMS) to self-govern transport operations and he said he was pleased to see that 200 fleets operating 10 000 trucks were now RTMS accredited. He thanked Hino SA for its involvement with the promotion of RTMS nationally since 2009 as the provider of venues for briefing sessions. He said case studies of RTMS fleets showed amazing improvements in terms of running and maintenance costs as well as a far lower accident rate resulting from using the correct RTMS procedures. 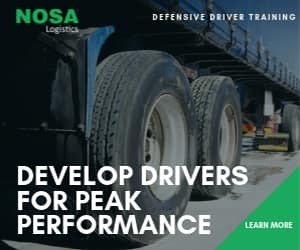 Nordengen bemoaned the fact that low levels of law enforcement in South Africa meant that probably only about 5% of trucks on the road were involved in interactions with law enforcers during a year, while he estimated that up to 40% of trucks on SA roads were non-compliant. 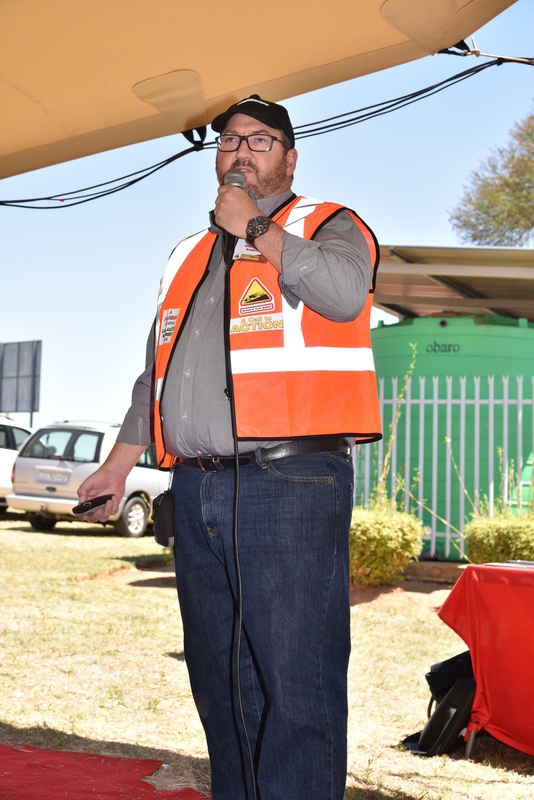 George Hartman, of BPW Axles, said that the high cost of road accidents in SA, estimated at R400-billion annually, were due to two major factors: the driver and poor vehicle maintenance, while he also laid part of the blame at the door of ineffective law enforcement. He said that a new law coming into force next year would cause havoc in the road transport industry. This was the requirement that the identical make and size of tyre be fitted to each side of an axle. Hartman added that he had already seen as many as five different tyres fitted to a truck. 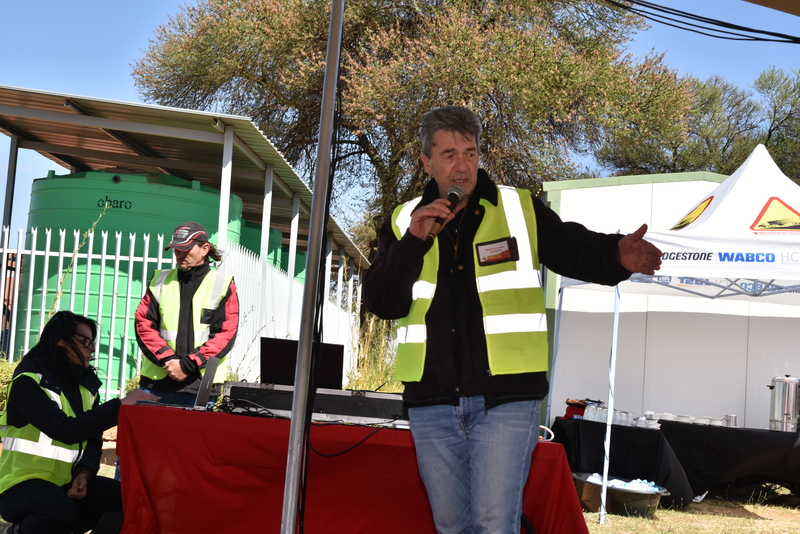 Steve Norris, a field engineer with Bridgestone, gave an interesting talk on the importance of fitting the correct tyres to transport rigs and ensuring that the correct tyre pressures were maintained. Kathy Bell, of the Vehicle and Asset Finance Division of Standard Bank, and a person who is vastly experienced and passionate about all aspects of the road transport industry said her company was particularly supportive of companies that were RTMS compliant as it meant their vehicles were a lower risk and would be in better condition when they were resold or traded in. 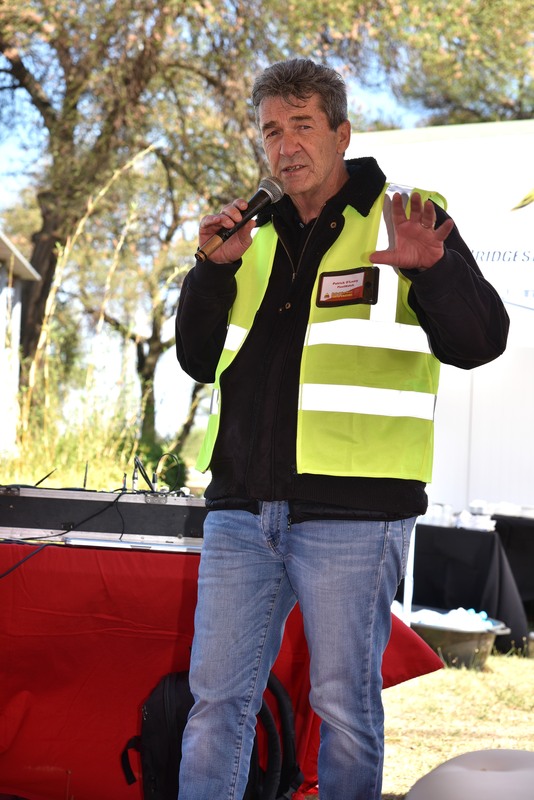 Arrie Meyer, a man with 25 years’ experience in law enforcement and currently the person responsible for operating the brake roller tester at the Donkerhoek test centre, said it was time to relook all aspects of the SA Road Traffic Regulations as some of them dated back to 1957. Teams were led under the trucks to inspect faults…the trucks never fail to disappoint. Meyer said another problem was that the prescribed test procedures and equipment used were not up to testing the latest technological advances in automotive engineering, adding that testing lights was a good example. He said it was time to Iift the standards. Meyer said that one of the operators which had upped its testing procedures of its own volition was the Inter-Cape Bus Company, which now has its buses Certificate of Fitness testing carried out every three months instead of the prescribed six-month interval. The information session was followed by practical inspections of trucks travelling the N4 towards Pretoria and two of the four checked were found to be unroadworthy. One had lost all the tread from a re-treaded tyre, while a couple had problems with their braking systems. One had a very worn main steering link. It was certainly an eye-opener for all those involved and highlights the fact that so many trucks on SA roads are unroadworthy and could well result in accidents. 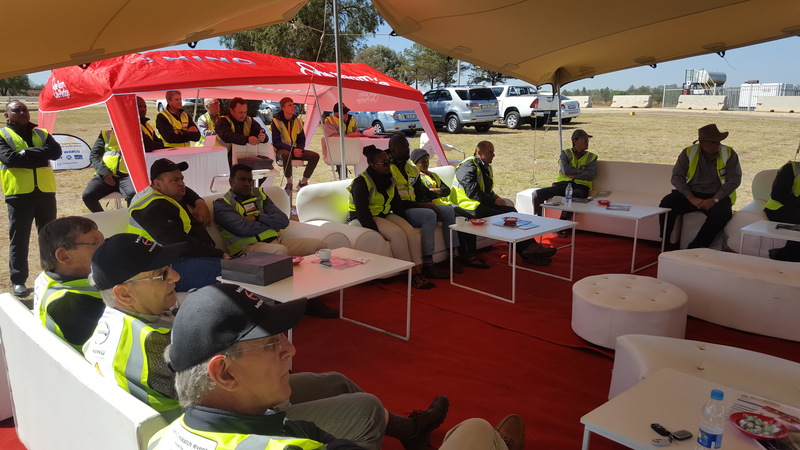 Ernie Trautmann, the Vice President of Hino SA, concluded the days’ proceedings by committing his company to continuing with road safety initiatives such as the Brake & Tyre Watch. He added that he was on a campaign to get his staff as well as Hino dealer staff to get their truck driver’s licences so they could see for themselves the challenges faced when driving a truck on today’s congested roads. Trautmann added that making safer trucks remained part of the Hino dream in Japan. 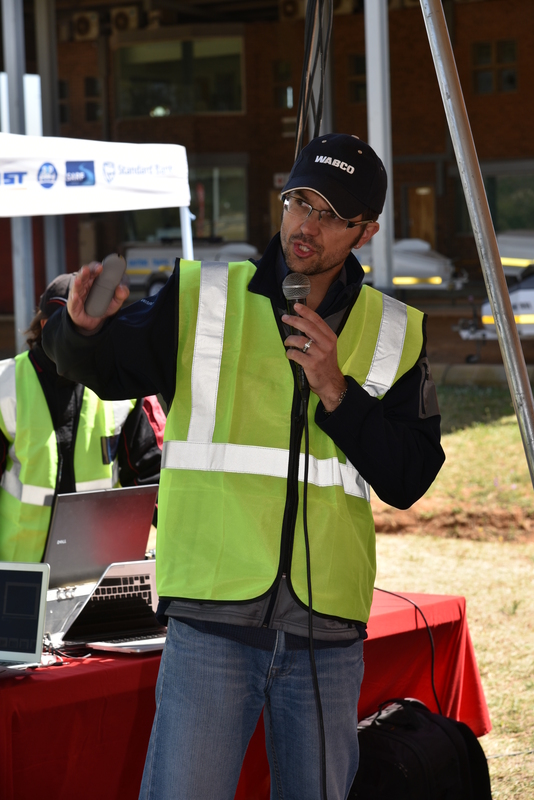 Any operators wishing to attend the special ‘Brake & Tyre Watch’ can enquire as FleetWatch is holding another event on the 24th October at Donkerhoek Vehicle Testing Station near Pretoria. A few places are still available ….. contact Kylie@fleetwatch.co.za or phone 011 794 2491.